Every year, the Nautical Archaeology Program at Texas A&M University hosts a day of free, family-friendly public events to spread the word about INA-affiliated research. This year’s event takes place on April 13th and focuses on ill-fated ocean voyages and expeditions. 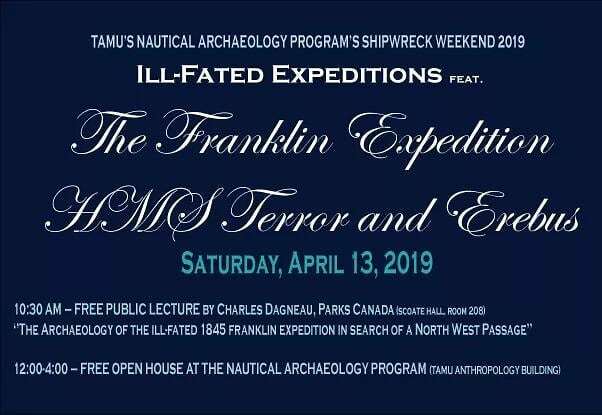 At 10:30 in Scoates Hall (room 208), there will be a free public lecture by Charles Dagneau from Parks Canada – ”The Archaeology of the ill-fated 1845 Franklin Expedition in search of a North West Passage.” The mystery surrounding the 1845 Franklin Expedition has captivated public attention for more than 170 years; poisoning, starvation, death, cannibalism, failed rescue missions, scattered relics, and dramatic Inuit accounts of the fate of Franklin’s men all contributed to creating one of the greatest mysteries in British and Canadian history. Between 2014 and 2018, the Parks Canada Underwater Archaeology team conducted an evaluation of the HMS Erebus wreck site and started targeted excavations, meanwhile initiating an evaluation of the HMS Terror wreck site. This public presentation provides an overview of the ongoing large-scale archaeological project, some preliminary results, and future plans. From 12:00-4:00 there will be an open house in the Anthropology building, with activities for all ages, including face painting, a treasure hunt, and a photo booth! The Nautical Archaeology Program research labs will be open with examples of current and past research conducted by the Nautical Archaeology Program, and current students of the program will be giving presentations throughout the day on their research and other ill-fated expeditions.